I had this bird stuck at the bottom of my chimney and I saved it's life :) What a great feeling! I was just as scared as he/she was. When ever I got close to reaching down and getting it out, it would hiss at me sending me running... lol, so I used the towel trick and after about an hour of trying to help it, I finally got it out! Took the big bird to my front yard and set it down gently and let go of it. He/she ran across my yard then took flight. Was nice to see it wasn't hurt in the process of saving it. 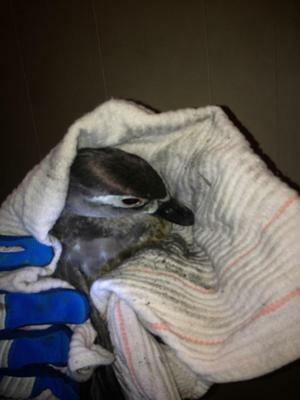 It's just a bird, but it gave me such a good feeling knowing it would have died in there if I hadn't have saved him. If you know what kind of bird this is please let me know. If I were to guess I would think some kind of Goose or Duck as its beak was round and not pointed, but I know very little about birds so I could be totally off. Poor little thing - I'm glad you were able to rescue it! I will also post this on our facebook page so that our facebook followers can also enjoy it. Comments for What kind of bird is this? 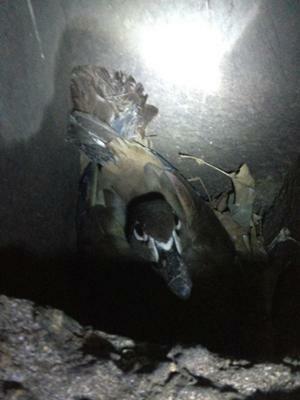 That looks to be either a female Wood Duck or a female Mandarin Duck they both look similar ! 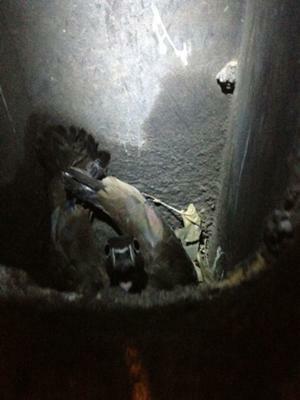 They both nest in holes in a tree that could explain why it went down the chimney!